Feel productive, contribute to the community and have fun doing it! The Mount Beauty & District Men’s Shed is a Level 1 member of the Australian Men’s Shed Association and as such is covered under the following Insurance Policies which expire on 1st March each year. The premium per member is $19.50. Voluntary Workers Personal Accident. Click [HERE] for full cover details. Cover shall apply whilst an Insured Person(s) is performing authorised work/voluntary work on behalf of the Insured, including necessary travel to and from such activities. If an Insured Person(s) is on holidays, cover shall extend to the Insured Person(s) performing authorised work or voluntary activities for and on behalf of an alternative shed to his registered shed. It is agreed that Insured Person(s) may assist with the non-specialised aspects of building Men’s Sheds where this work is undertaken by the Association. Qualified Tradesmen will be employed for the specialist skills required but underwriters acknowledge that this policy will extend to cover volunteer workers assisting these tradesmen with non-specialist work – such as assisting with the formwork for the concrete pad; cleaning up the site etc. Express Exclusion: This Policy will not extend any coverage to any Insured Person where any work is performed above 3.5 metres from the ground. Public & Products Liability ($20,000,000), Care Custody & Control ($250,000) and Molestation Extension ($250,000). 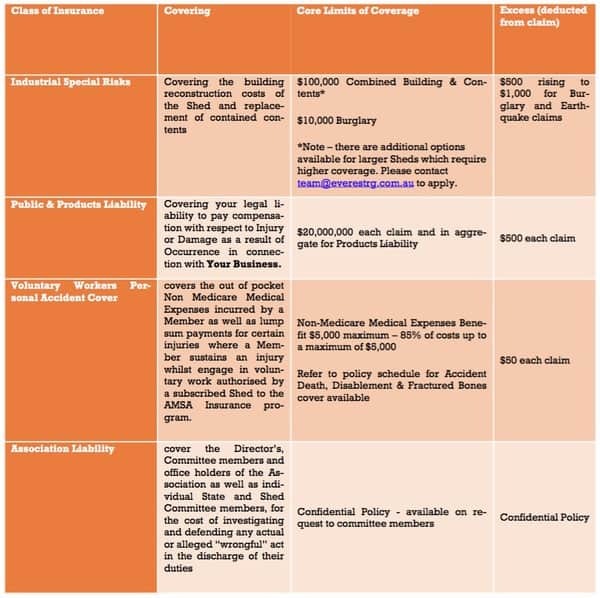 Association Liability Insurance ($10,000,000 cover) e.g.for claims against committee members, professional indemnity, employment practices, crime etc. Membership to AMSA is free.